Milking the system for all they can get now appears to be a strategy employed by radical Islamic extremists. While counter terrorism investigators were busy searching for the funding terrorist organizations used to plan attacks and get out their message of violence against all non-believers, there is one place nobody thought to look: the social welfare line. We now know that some of the individuals involved in the terror attacks in Paris and Brussels were supported by benefits supplied by Europe's social welfare net. Some of the money came from unemployment claims and some came from student assistance claims submitted by the terrorists while they were planning the attacks. "We've identified that the benefit system is vulnerable to abuse for terrorist financing purposes," Tom Keatinge, director of the Centre for Financial Crime and Security Studies at the Royal United Services Institute in London said. And then he posed the question, "What are we going to do about that?" One of those who received benefits was Anjem Choudary, the radical Islamic preacher who for more than 20 years proselytized and recruited people to a radical form of Islam that encourages jihad as a necessary tenet of the faith. He did it on street corners, mosques, and in front of television cameras. Choudary received more than £25,000, or roughly $40,000 a year, in social benefits. He had the audacity to call those payments "Jihad Seeker's Allowance." He described it to his flock of potential jihadists as a form of jizya. According to the Quran and the Hadiths, the jizya is a per capita yearly tax historically levied by Islamic states on certain non-Muslim subjects permanently residing in Muslim lands under Islamic law. Choudary taught that milking the social welfare system was another form of collecting the payment that was owed to Muslims. Sly like a fox, he avoided prosecution for years because no direct contact between him and a terrorist organization could be proven. But then British authorities uncovered a video of Choudary pledging allegiance to ISIS leader Abu Bakr al Baghdadi. He was convicted of providing material support to a terrorist organization and was sentenced to a mere 5½ years in a specialized maximum security unit. A similar case is taking place right here in the United States. 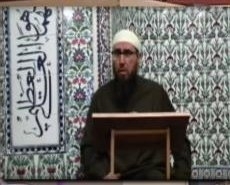 Suleiman Anwar Bengharsa has been an Islamic cleric in the Baltimore area for more than 10 years. During that time he has drawn FBI attention for his fiery sermons, which, like Choudary's, walk right up to the legal line of incitement. But it has yet to be proven that he crossed it. Bengharsa founded the Islamic Jurisprudence Center, which calls for the death of homosexuals. He has also been implicated in the case of Sebastian Gregerson, a Muslim convert who was arrested in July for possessing explosive devices. According to the New York Times, an FBI affidavit from last year that was mistakenly filed publicly said that Bengharsa gave Gregerson $1,300 in June 2015. Gregerson, who also goes by the name Abdurrahaman Bin Mikaayl, then used the money to buy grenades and other weapons. The reason for them, according to the agent who wrote the affidavit was clear: "Based on the totality of the aforementioned information and evidence, there is reason to believe that Bengharsa and Gregerson are engaged in discussions and preparations for some violent act on behalf of the Islamic State." And yet Bengharsa, like Choudary did for so many years, has avoided being charged with any crime. Bengharsa is a former civil servant employed by both the federal government and the state of Maryland. He worked for the U.S. Department of Commerce as an international trade specialist, a position that paid over $80,000 a year. Bengharsa resigned in 2006 after admitting to plagiarism, records show. He filed for unemployment compensation, which was contested by the Department of Commerce and upheld by a D.C. administrative judge. From there Bengharsa applied to the Maryland Department of Public Safety and Correctional Services to be a prison chaplain. He worked in the state prison system until 2009 when he filed for worker's compensation, alleging he was hurt lifting a box of books. The more alarming fact is that someone like Bengharsa, who holds radical Islamic views and preaches a message of hate, was even considered to work in the prison environment. Authorities have known for quite some time that prisons are fertile soil for recruiting potential Islamic terrorists, and that one of the catalysts in the radicalization process is the presence of clergy or religious volunteers holding extremist views. Bengharsa's dismissal from that sensitive position should have occurred before he was able to apply for a financial benefit from Maryland taxpayers. The social safety net was designed to help those in our society who truly need a hand up. Not a radical Islamist who wants a handout.